Juke Slot the Next Step into Social Integration and Customer Interaction for the Casino Floor! Casinos 4 Dummies | Juke Slot the Next Step into Social Integration and Customer Interaction for the Casino Floor! A new way of communicating with your customers on the gaming floor, giving your customers what they want so they never have to leave where they are sat, a step closer to online gaming on the casino floor, Your favourite music, your favourite food, your favourite drink brought right where you are sat, for you the operator, efficiency in your floor staff, no need for them to wander around without purpose. Perhaps you could even measure yours staff’s efficiency ! The Juke Slot tablet kiosk is a universal device that is designed to attach to any electronic gaming machine on the casino floor. The kiosk includes a Card Reader for recognition of Player Reward cards and Credit Cards. The tablet kiosk includes Internet Radio and a Social Networking capabilities that attracts younger players to want to spend more time at the slot machine! 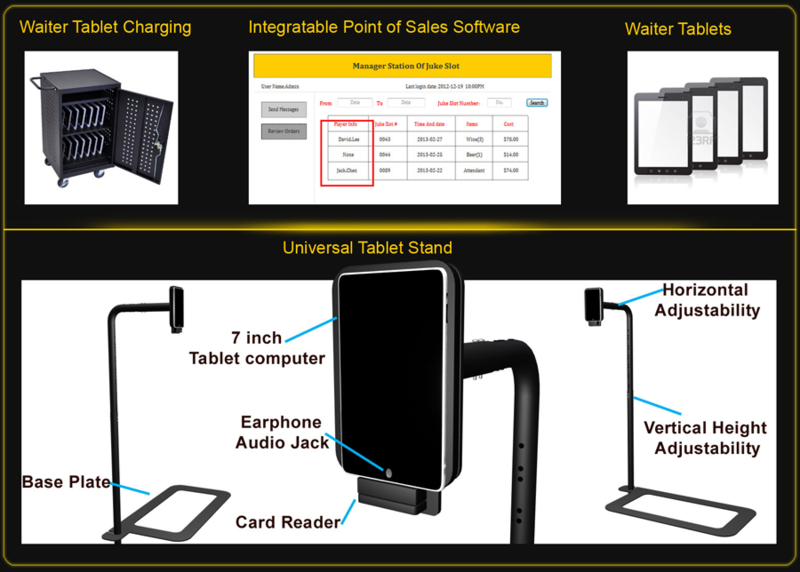 Tablet kiosk backend includes a patent 3D Virtual Floor Plan that allows servers to locate and deliver orders at a never before speed! The Tablet kiosk allows casino managers to input advertisements and promotions and send messages and alerts to all kiosks on the Casino Floor, with the Click of a Button! Music has played a major role in the casino industry for many years. From music themed casinos to legendary musician themed slot machines such as Michael Jackson and Elvis Presley. North and Hargreaves (1997) noted that music may have the ability to change psychological arousal or create relaxation. Juke Slot is the first device invented to allow a player to access their favourite music or song (via internet radio) while playing a slot machine! Being that Juke Slot music can only be heard using earphones, it allows players to not be distracted by some of the most irritating, obnoxious players in the casino. Juke Slot is a SOLUTION to avoid player distractions and allows players to enjoy the games while listening to their FAVORITE TUNES! We all know in the industry that as soon as a player leaves their gaming chair for whatever reason the chances of them returning are reduced, one distraction leads to another distraction and ultimately leaving the establishment possibly with unspent revenue in their pockets.